Created to serve dragons directly as their day-to-day servants, lizardlings are intelligent, highly regimented, and focused on honor and recognition. The lizardlings developed by far the most established civilization on the wild continent of Tarakona, with large, terraced wooden cities and palaces that stretch for miles. They are ruled by the Golden Emperor who lives in the Eternal Palace in the Valley of the Seven Sunsets. It is a massive complex twenty miles square, employing over a thousand servants (not to mention the harem, accountants, and so forth). Officially, the Emperor is wise and fair to his subjects. In reality, the current Emperor, Suhesho XVII, indulges in fits of spite and has a significant gambling problem. He’s far from the worst emperor, though, and he at least treads relatively lightly on the backs of his people. The lizardlings control most of the land in the southern end of the continent, favoring fertile valleys, hills, and forests. Their land is divided into the Seven Hundred Provinces (there are actually 756), each of which is divided into its Districts, then into towns and villages. Each Province, District, town, and even neighborhood has its own set of bureaucrats serving as magistrates and tax collectors. According to the law, they are absolutely fair and serve only the good of the Emperor and his people. In reality, bribes often fall into their pockets. In fairness, the bureaucrats have tough jobs, as they’re expected to keep the peace in their assigned area, enforce the law, and carry out any edicts sent from the Eternal Palace, many of which conflict with each other. They are often pulled in many directions at once. Kasuhemee commands the garrison, which employs only himself. He’s hand-picked five locals as militia, who come by the garrison once per week to practice listlessly with rusty swords for about an hour. Non-attendance is technically treason, which would earn them a beheading. Kasuhemee keeps the small garrison locked up and relatively clean. He takes his job very seriously, making his rounds like clockwork. He’s the strong arm of the law, but nothing ever happens in this district. The court of the city of Nuheki provides a helpful example of lizardling culture. The stone palace stands on a hill overlooking the city, designed with six towers forming a hexagon. I entered through the massive entrance, the steel portcullis conspicuously visible above, and down an entrance hall fit with murder holes. As usual in this region, the entrance is large but stark and strictly defensive, reminding the visitor of the owner’s martial resources. Within, after crossing a courtyard and into another hallway, I was presented in the central chamber. This hexagonal room contains six round pillars supporting a complex buttressed ceiling. The back half of the chamber contained several raised daises, each a step taller than the previous and strewn with brightly-colored cushions. On the top dais lounged the ruler, surrounded by a handful of lizardlings on the same dais and the one below. Official advisers wore ornate but drably-colored clothes, while courtiers and entertainers wore brightly-colored, loose clothing. Other cultures whisper in shock about the courtiers’ delicate attire, hinting that they prance around practically naked in diaphanous harem outfits, but in reality their clothing is more comfortable than flimsy. Lizardlings take great pride in lineage and status. Every lizardling can trace its bloodline back at least 5 generations. As such, if you asked for a lizardling’s full name, you’d hear something like Kih sa Kihsoh sa Niguhey sa Mituhey sa Kosala (Kih, child of Kihsoh, child of Niguhey, etc.). However, outside adventurers are likely to never hear more than any lizardling’s first name. They are also a superstitious race. Papers inscribed with spells (some truly effective and some just superstition) are tacked up in every home and at many public places. Since many objects possess souls—particularly objects used often—the souls within them must be appeased. While omnivorous, lizardlings eat primarily fungi, grains, and fruits, with small amounts of stewed or roasted meat once per day. They maintain large farming operations for these purposes, including vast underground caverns full of fungi. It is said that the first lizardlings constantly stole pieces of meat intended for the dragons, so the dragons cast a spell causing them to turn vegetarian. This seems unlikely, as meat is eaten at all levels of lizardling society, especially the upper levels (though far less often than in other regions of Tarakona). Two major, more-or-less competing religions operate within the lizardling empire. Tara is a religion focusing on personal self-improvement, and has both spiritual and practical aspects. Tara teaches that every soul is reincarnated; evil souls into a lower animal, and good souls back into a lizardling. Practically, tara advises physical training in martial arts as a focus for the mind and body, as well as a quiet, contemplative attitude. Tara is taught from the Thirteen Tablets handed down from the great dragon Vorron Kosh. While msot of the races of Tarakona feel little love for their former masters, tara was too deeply ingrained to let go. It is now accepted as a valid belief system despite its origin. Tara has a well-established priesthood, with temples (for worship) and shrines (honoring ancestors) in every lizardling city. Soshinma establishes a concept of the universe for lizardlings, teaching that many objects have souls. These potential souls are treated more with fear than respect, since they will curse you if you don’t treat them right. The soul within a rock face must be appeased and satisfied before quarrying it, for example. Some lizardlings practice both these religions, and some follow cults and splinter sects of each. 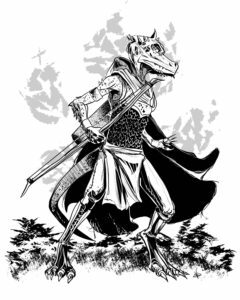 Of the three dominant races on Tarakona, the lizardlings are most likely to hire outside adventurers directly. While they maintain a standing army, their love of order and bureaucracy makes them poor adventurers. A regional magistrate or garrison commander might send a runner to the adventurers and ask them to deal with a delicate matter. A cavern used to grow mushrooms has been overrun by giant snakes. A komodo raiding party intruded onto lizardling land in search of an old temple. While aggressive if approached, they have avoided direct contact. A tara priest discovered a map leading to a sunken storehouse that contains the Mirror of Vorron Kosh, a famous ancient artifact. Lizardlings sent to retrieve it never returned.